Lots of charity communications use tangible items – like gifts, examples of work produced, free pens, DVDs – to help bolster their messages. I’ve seen press packs containing USB drives of project photos and direct mail packs with free drinks coasters, among other things. But are they worth the money? Do they work? The answer isn’t a simple yes or no, I’m afraid. It depends on what your communication is trying to achieve, with what audience and through what medium. For example, the ubiquitous address labels that some charities use as part of their fundraising mailing campaigns might be perceived as cheesy and old-fashioned – but there is much evidence to suggest that they still have a positive effect on response rates. And as long as the ROI (return on investment) is acceptable, they will continue to be used. But common sense tells us that this technique won’t apply across every audience, so charities need to think clearly about what exactly the "tangible" elements of any communications are trying to achieve. Here’s an example from the most recent direct mail and door drop campaigns by the Royal British Legion. These (see above) are part of the contents of a personalised mailing I received to invite me to join the remembrance campaign this year and to consider making a donation. 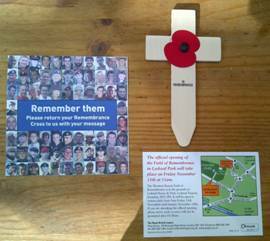 The tangible elements came in the form of a lightweight wooden cross with a poppy attached and a card explaining about the new garden of remembrance being opened on Armistice Day. Recipients are invited to complete a message on the cross (or online) and send it back to the charity. The cross would then be placed with others received in the new garden of remembrance. As a poppy wearer, this mechanism appeals as it gives me the opportunity to tangibly mark Remembrance Day and all that this means. I received this second communication (see right) the following week as a generic door drop (the ROI of which may be questionable but that’s not the point I’m making here). As a non-personalised piece, the charity will know less about the recipient and is probably less sure of the likelihood of a positive response and donation. The packs show photos of historic and contemporary service personnel – real people helped by the charity, who recipients can relate to. The mechanism asks me to engage with the cause by giving me the opportunity to send my own messages; I’m involved, not just an observer. The messages actually become part of memorials which people can visit into the future. Donors will have an enduring reminder of what their support helps to deliver and what they have been a part of. Sounds obvious, but think creatively about what will appeal to your target audience. Address labels tend not to work if sent to an audience that doesn’t write letters or send lots of cards. Tangibility does not necessarily mean gifts and give-aways. The ‘poppy’ campaigns above incorporate different techniques and ideas to make their cause and their ‘ask’ very tangible to recipients. If you are using gifts to bring tangibility, give them high perceived value and link them to your cause or to the point of your campaign. For example, I’ve received a mosquito net from a malaria charity as part of a fundraising campaign to get me to buy another 10. Like the Royal British Legion, layer different aspects of tangibility throughout your communications. You aren’t limited to just one and the more you focus on the positive, tangible outcomes that the recipient’s support or cooperation will generate, the more likely you are to drive that action. If you can, test your new ideas before committing significant budget to them. A clever idea does not guarantee ROI!